LITTLE ROCK, AR (Nov. 2, 2018) — Rev. J. Wayne Clark, Associate Vice President for Development and Dean of the Chapel at Hendrix College in Conway, Arkansas has been named President and CEO of The United Methodist Foundation of Arkansas and will begin his new role in January 2019. Clark, a native of Malvern, AR and a 1984 Hendrix College graduate, received his master’s degree from the Perkins School of Theology at Southern Methodist University in Dallas, Texas, in 1989. Since 2012, he has served as Director of the Arkansas Conference Course of Study through SMU and the Perkins School of Theology. Before returning to Hendrix College in 1996, he served as chaplain for Children’s Medical Center’s Hematology, Oncology and Neurology Departments in Dallas; as minister of Halifax Methodist Circuit in Halifax, England; and associate minister of Lovers Lane United Methodist Church in Dallas. He has served Arkansas United Methodist Churches in Magnolia and Pine Bluff. 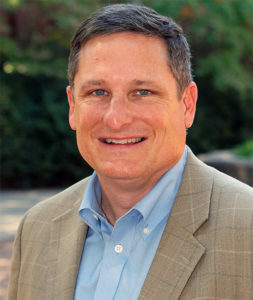 As the Associate Vice President of Development and Dean of the Chapel for Hendrix College, Clark successfully directed the planning that led to a $2 million grant from The Lilly Foundation to develop programs to assist students in the “theological exploration of vocation.” During the five-years, he successfully helped secure an additional $1.5 million to extend the original grant three years. Clark effectively worked to secure a $1 million gift to continue the work and programming of the Lilly Foundation to be named the Miller Center for Vocation Ethics and Calling. He was instrumental in writing and receiving a $500,000 five-year grant from The Lilly Foundation to establish a program for Clergy and Civic Engagement and in securing a $50,000 gift to endow the John and Marjem Gill Preaching Workshop. Founded in 1963, The United Methodist Foundation of Arkansas is responsible for over 800 funds. It manages $165 million in endowment funds and other charitable assets that benefit local churches and United Methodist ministries. The Foundation provided over $5.5 million in grants and distributions to Arkansas United Methodist ministries for programs and services in 2017. Visit www.umfa.org to learn more. A private liberal arts college in Conway, Arkansas, Hendrix College consistently earns recognition as one of the country’s leading liberal arts institutions, and is featured in Colleges That Change Lives: 40 Schools That Will Change the Way You Think About College. Its academic quality and value have established Hendrix as s fixture in numerous college guides, lists, and rankings. Founded in 1876, Hendrix has been affiliated with the United Methodist Church since 1884. To learn more, visit www.hendrix.edu.